It was pouring again this morning, but we were determined to see the Hoi An old quarter during the day. 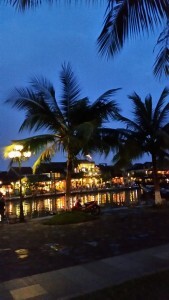 The town comprises a well-preserved complex of 1,107 timber frame buildings, with brick or wooden walls, which include architectural monuments, commercial and domestic structures, an open market and a ferry quay, pagodas and family cult houses. The houses are tiled and the wooden components are carved with traditional motifs. They are arranged side-by-side in tight, unbroken rows along narrow pedestrian streets… The original street plan, which developed as the town became a port, remains… Typically, the buildings front the streets for convenient customer access while the backs of the buildings open to the river allowing easy loading and off-loading of goods from boats. The surviving wooden structures and street plan are original, intact and present a traditional townscape of the 17th and 18th centuries, unique in the region. And we love it. We started off our morning looking for better rain gear. I graduated from the pale-green, thin plastic to a thicker, deep blue plastic – a very stylish poncho. Thanks to Linh at our homestay, we had huge umbrellas. Totally prepared, we stood on a corner and watched a community, local business-sponsored parade, then on to an Australian-run fresh juice cafe. A chocolate-chai latte and a beet-ginger juice later, we set out in the rain. We made it as far as across the street and were forced to stop in Avana, a Western-style clothing boutique. Chris was working and with infinite patience, she and Rachelle dressed me. Rachelle also found some pieces she loved and Chris arranged for a local tailor to adjust hems for her. A new wardrobe and hours later we emerged and found that the rain had stopped. Attn: Elan and Adam – Rachelle promised to go through my closet with me and do a major purge. We went up and down alleys, did a bit of bargaining and fell in love with an 8-week old puppy. Thinking of bringing him home instead of the usual tchotchkes. we happily ran into Valentina and Dina, our Russian friends from Switzerland. We had not seen them since our Hanoi city tour so it was fun to catch up. They were with a lovely Australian woman, and we all went out for a beer. Eventually, we found a restaurant down an alley and in a courtyard. It was a beautiful place with tables surrounding a lily pond. The lights were on, they were staying open, so we ate a light dinner there. It was late, this time we took a taxi back to our place. We arrived in DaNang late afternoon, and drove straight to Hoi An. Our homestay, Loc Phat is a sweet, small place close to town and about 3 km from the beach. Our host family lives adjacent. Linh helped us settled in, then we went for a walk. 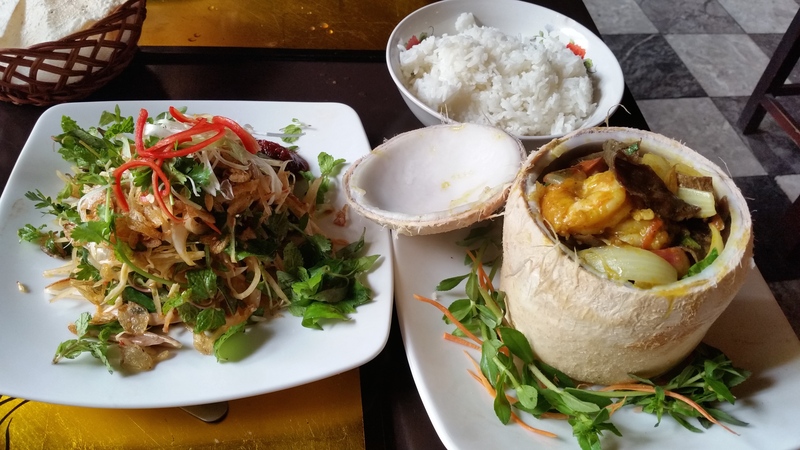 The food here is supposed to be the best in Vietnam. Judging by the Banh Mi we had at the corner (Linh’s suggestion), I’ll swear to it. We have no plans here yet and the break feels good. Got up early and sat at breakfast for a few hours. It’s rainincrazy hard, but with Linh’s help, we signed up for a cooking class anyway. Called the Thuan Tinh Island – Cooking Tour, we spent the first hour or so in the marketplace, in the pouring rain. Always one of my favorite places, I’m coming home with tons of pictures of vegetables. The markets are covered, but to get from one side of the street to the other we were ankle deep in water. Hurray for kayaking shoes. We bought greens, beef, and chicken. I found pennywort and although we did not make the salad we had in Burma, we bought some for our spring rolls. Then we boarded a boat and traveled about a half hour down river. On the way, our guide, Hihn, told us a bit about the tax system, how cars are taxed so heavily, a used American car would cost about $20,000 and a new American car, $60,000, That there is no free health care. We switched to row boats and paddled through water palms to a tiny dock. Covered with pink and pale green plastic raincoats, we look like pastel cake decorations. But we’re dry…ish. We were an odd group, a bickering couple from Canada, a sweet young Israeli couple, and two German girls. It was only odd because the bickering couple continued to make side comments about each other all afternoon. Hinh showed us how to make rice milk, using a grinding stone, the same type we have in our garden at home. We took the rice milk over to the outdoor kitchen and set it aside. 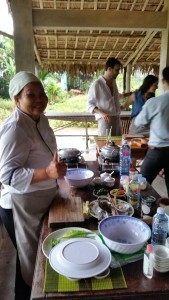 We were introduced to our cooking instructor, a formidable woman who was insistent we do thing her way! The plan for the afternoon was to put up the beef broth first, so it could simmer 1 1/2 hours. It was a classic bone broth infused for 5 minutes with cinnamon bark and star anise. We learned that any longer and the spices would have turned the broth bitter. In the meantime, we made fancy spring rolls, learning to roll them differently than usual. They tasted great, in if not perfectly rolled. Then we used our rice milk for pancakes filled with vegetables and shrimp. We were under the impression they were made with egg, as they come out rather yellowish, but it’s the turmeric in the batter. It’s Rachelle’s favorite, and really good. I liked the idea of creating, then eating each dish as it came up. The third dish was a beautiful beef noodle salad, with mostly greens. Our instructor gave us precise instructions on decorating the plate: 24 1/2 moons of cucumber, 6 in a row, 4 rows, radiating in from the rim of the plate, each row flanked by 2 strips of carrots. Compose the salad in the center, in the designated order…. You get the idea. Rachelle the rebel, was pretty much in trouble the whole time. Finally, we went back to our beef broth and assembled a delicious soup. All in all, a very satisfying, filling day! We took a car back, changed and went into the old quarter for the evening. No cars on the streets, so one would think it’s safe to walk, but motor bikes are allowed, so be on your guard. We found a little restaurant and had a banana flower salad. The first time I had it was in India, and it was 100 times better here. The mackerel stew was not so good. The fish was so overlooked we just left it. When the waitress came around, she was distressed that we left the fish. We explained that it was tough. She left for a moment, came back with a fruit plate and explained that it would be taken off the bill. She apologized profusely and hoped we would return. I thought it was so professional of the restaurant staff, and will give it a good review on trip advisor. Returning back to the homestay, we got on the back of some guy’s bike. He way overcharged us, though I thought he should have paid us as Rachelle was right behind him and he seemed to be enjoying it too much. This morning a bus and our guide Minh, picked us up and we had a 2 1/2 hr ride to Hoa Lu, the ancient citadel of Viet Nam in the 10th Century. It’s located in Ninh Binh Province, the ancient capital of Vietnam. We saw the temple dedicated to the emperor and learned that a temple and pagoda look exactly alike from the exterior. The difference is that a pagoda is dedicated to the buddha, and a temple is dedicated to a local person of note. 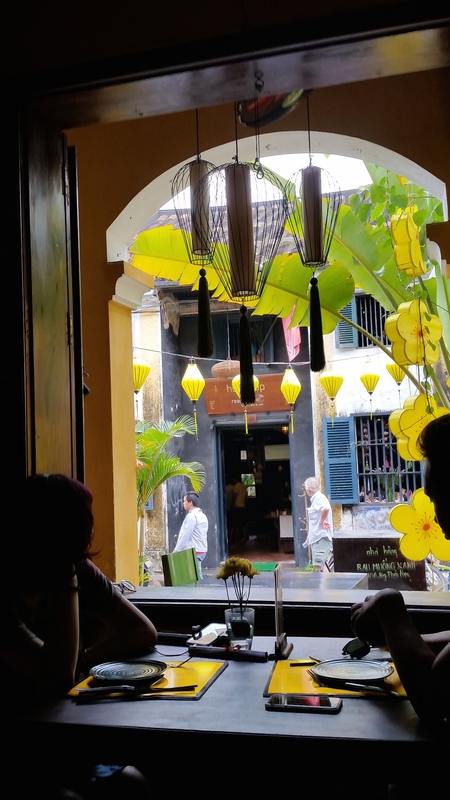 Minh explained why the homes and buildings are so long and narrow, at least in the old quarter of Hanoi. The emperor imposed taxes based on property frontage, so if your space was narrow and deep, you would pay less than the same square footage that was shallow and wide! We learned s bit about the language. Every word is only one syllable, so, for example, “America” is 4 separate words. On top of that, there are 5 ways to pronounce “la”, depending on tone. Each has an entirely different meaning. It helped pass the time and before long, we were at the halfway point, at another one of those tourist stops. This one also had a section of crafts being made by people maimed by Agent Orange, dropped by US troops during the war. It was terrible to see what we did here. We stopped for lunch at a restaurant overlooking the river. Lunch was nothing worth describing though we did get to taste the famous goat meat, a speciality in Ninh Binh. We then boarded little sampan boats and 2 per boat, were rowed up, then down the river, along with scores of others. For a few moments, I felt like I was on Jungle Cruise at Disneyland. (“We are now approaching Schweitzer Falls, named after the famous explorer, Dr. Falls”). I love Jungle Crusie, so, no matter. The locals row with their feet – amazing flexibility, dexterity, and strength. It was quite beautiful and we appreciated the silence and fresh air. The rock outcropping are the same as on Ha Long Bay, but arise out of the earth rather than the sea. We passed through three caves, Hang Ca, Hang Hai and Hang Ba. We then hopped on bicycles and took a short ride between Hoa Lu and Tam Coc, through the villages and adjoining rice fields. 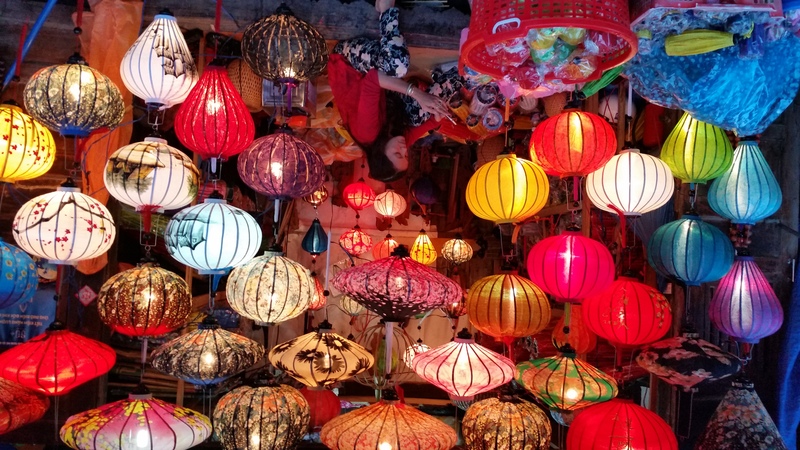 We returned to Hanoi in a light rain, and got off the bus in the old quarter. Walking back to our hotel, we found the place for pho. Minh suggested we look for a sidewalk setup with a huge pot of simmering stock. The larger the pot, the more customers served and the better the pho. Our soup was perfect. Turns out all those sidewalk setups are illegal. When the police come by, the customers stand up, the tables and chairs disappear along with the soup. As soon as the police pass by, everything reappears and you can finish your meal. Tomorrow we leave Hanoi for Hoi An.